Xi'an City Guide. China Travel Services. CTS. Los Angeles. San Francisco. Xi'an is the cradle of ancient Chinese civilization, with a history dating back to 4000 BC. Known as Chang’an in early times, it was the capital of China for eleven dynasties, up to the 9th century. It is from here that caravans started on the Silk Road to Europe, changing the Western world forever. The extraordinary life-size warrior figures of the 6,000 strong terra cotta army were created to protect the first Qin emperor in the afterlife. Exploring Xi’an is akin to traveling back thousands of years in time. Now the capital of Shaanxi Province, Xi’an is also the political, economic and cultural center of the Northwest, with a population of 2,650,000. Chinese calligraphy, like the script itself, began with hieroglyphs which evolved over time into various distinct styles and schools, constituting an important part of China’s national heritage. Chinese scripts are generally divided into five categories: the seal character (zhuan), the official or clerical script (li), the regular script (kai), the running hand (xing) and the cursive hand (cao). Xi’an’s folk crafts have many varieties and a long history. Among the fairly famous ones are clay toys, cloth piecework, embroidery, puppets and leather shadow show figures. Most of the crafts follow the artistic traditions of peasant handicrafts, so they are simple and natural in style yet brightly colored. This nightly performance recreates the music, dance and costumes of the Tang dynasty era, and is preceded by a banquet served in the imperial manner of former days. "Soul of a Qin-Dynasty Terra cotta Warrior” is a contemporary dance drama that portrays the commendable accomplishments of Qinshihuang, father of Qin Dynasty, and the life of the people during that time. This nightly showcase celebrates the Qin Emperor’s triumphs with singing, mask dancing and a white ribbon dance. This festival features a full-length artistic performance filled with local folklore and includes traditional cultural exhibitions. Business is also conducted during this festival, giving investors an opportunity to combine business with pleasure. 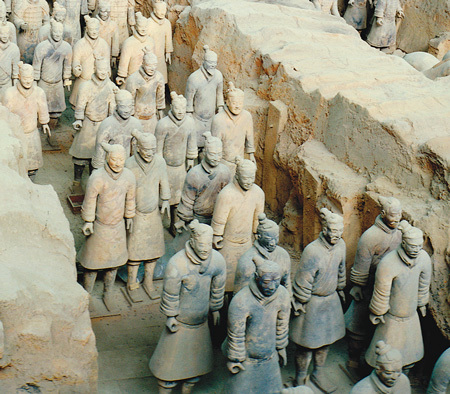 Xi'an’s most famous attraction is the life-size Terra Cotta Army, one of the greatest archaeological finds of the 20th century. A farmer digging a well in 1974 discovered a tomb which had been undisturbed for 2000 years. Inside were found 6000 terra cotta warriors and horses, guarding the tomb of Emperor Qin Shihuang, the first emperor of a unified China. Three exhibition halls house the continuing excavation, a stunning exhibit of ancient artifacts. It was the custom for many dynasties to erect stone tablets in front of tombs to record the merits and achievements of the deceased; many of these stone tablets and their calligraphy remain to this day. The Forest of Steles Museum was originally founded in 1090 AD, and since then the collection has been expanded to include 11,000 precious objects. Housed in a Confucian temple dating originally to the latter part of the Northern Song dynasty, this treasure house of Chinese calligraphic art includes more than 2300 steles from the Han, Wei, Sui, Tang, Song, Yuan, Ming and Qing Dynasties. The Bell Tower was constructed during the Ming Dynasty and offers an excellent view over the city. This stunning new building was built as a museum to display rare relics of Neolithic pottery and jewelry, Zhou bronzes, Qin architectural material, Han pottery figurines, etc. that have been unearthed in the region. Located 30 km east of Xi’an at the foot of Lishan Mountain is Huaqing Hot Springs. For more than three thousand years it served as the summer palace and resort for monarchs of various dynasties. A mansion built on the mountain slope dates to the Tang Dynasty and was built by Emperor Xuanzong. Banpo Museum, located to the east of Xi'an, is the site of a village dating back 6,000 years to the Neolithic Era, and is the earliest known example of Yangshao culture. The site was discovered in 1953 and covers an area of approximately 50,000 square meters. Excavations revealed 45 houses, pottery, kilns, a burial ground, grain stores and tool stores. Banpo is considered one of the finest examples in the world of a preserved agricultural community from the Neolithic era. The largest and most well-preserved city wall in China, the Xi’an city wall forms a rectangle 11.9 kilometers in circumference and stands 12 meters tall. The wall is 15-18 meters wide at the bottom, narrowing to 12-14 meters wide at the top. It has gates on all four sides, and is topped with watchtowers and ramparts. The existing wall was built during the early years of the Ming dynasty, atop the foundations of the original city wall built during the Tang dynasty. The Famen Si (Doorway Temple), 115 kms northwest of Xi’an, is a well-known Buddhist temple where four sacred finger bones of the Buddha (known as sariras) are preserved. It was first built during the Eastern Han Dynasty (25-220 AD) and the underground palace, discovered in 1981, is by far the largest of its kind ever discovered underneath a Buddhist stupa. The four sariras were found here in an eight-layered container, along with a rare collection of 2,400 precious cultural relics, including Tang-dynasty imperial gold and silver utensils, coins, glassware, porcelains, pearls and precious stones and textiles. The Dayan (Big Wild Goose) Pagoda of Ci'en Temple, dating originally to 652, is a seven-story gray brick structure, in the shape of a simple square pyramid. Standing 64 meters tall it is a solemn looking masterpiece of ancient Buddhist architecture. The Xiaoyan (Lesser Wild Goose) Pagoda of Jianfu Temple stands 43 meters high and is a 13-layer square structure of bricks with folded eaves. Its width diminishes gracefully from bottom to top as each tier becomes gradually smaller. Xianyang Airport is approximately 40 km, or 45 minutes, northeast of downtown Xi'an. Xi’an is connected via domestic flights to many cities in China, and has direct flights to a limited number of international destinations. The train station in Xi'an is situated in the northeast of the town and is just outside the city walls. This is a major stop for trains heading either west or east and the line actually splits here. The ticket office is on the second level of the train station which is open from 8.30-11.30 and 2.30-5.30. Be sure to bring your passport with you as you need this document to register. Most of the major hotels can book train tickets for you as a convenience.